I was contacted the other day by an artist going under the name of Mute, who wanted to let me know about their recent first solo exhibition which was entitled “Lost in the 80s”. Sounds interesting, thought I, so I hopped on over to Mute’s website to take a peek. I have to say I was very excited about what I saw, especially when I scrolled right to the bottom of the gallery page and found the image that is adorning this very post. I know I keep droning on about how much I love Ghostbusters (indeed I’m wearing the T-shirt as I write this) so this image was perfect for me, and I hope Mute doesn’t mind me pinching it to use as an example, especially since it wasn’t actually part of the Lost in the 80s exhibition. I urge you to head over to Mute’s Gallery to take a look at the great pieces of artwork that made up the Lost in the 80s exhibition. 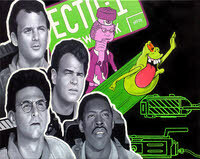 They are all styled in a similar manner, with a very accurate portrait of an Eighties movie star, overlaid with another related image drawn as a piece of glowing line art and some other relevant imagery. It’s also nice that, for the most part, Mute has gone with well known films but perhaps chosen the less obvious route for the subject matter. For example, it would have been easy to go with Marty McFly and Doc Brown for the Back to the Future 2 piece, but instead we’re given the old and young Biff Tannen, which I think makes the piece even more appealing to a fan of that particular movie, since arguably it is Biff’s actions that make up most of the story of that film. This entry is filed under Miscellaneous	and was posted on February 9th, 2011. You can follow any responses to this entry through the RSS 2.0 feed. You can leave a response, or trackback from your own site.